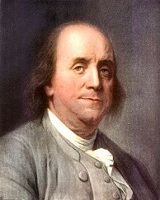 Benjamin Franklin 17 January 1706 17 April 1790 American Josiah Franklin Abiah Folger Printer, Satirist, Librarian, Statesman, Diplomat, Political activist, Author, Editor, Inventor Benjamin Franklin was many things but As a scientist, he is best known for his experiments with electricity. As a writer, he is known for Poor Richard's Almanac and his autobiography. A list of popular Hindi Benjamin Franklin quotes are given below.